A cacao pod in Venezuela, 2015. Image via AP. Another daily disaster to file away into the glove compartment of our hearts: according to a new report in Business Insider, chocolate is doomed to be wiped off the face of this cruel world as early as 2050. M&M’s endangered. Snickers perishing. Hershey’s murdered. The last batch of cacao could be ground up and snorted like rhino horns, for all humans care. Thankfully, we have the blessed geneticists. Scientific American foretold threats of deadly fungal diseases to cacao trees in 2010. Business Insider adds that thanks to the fact that cacao plants are restricted to “a narrow strip of rainforested land roughly 20 degrees north and south of the equator, where temperature, rain, and humidity all stay relatively constant throughout the year,” cacao is particularly susceptible to global warming. 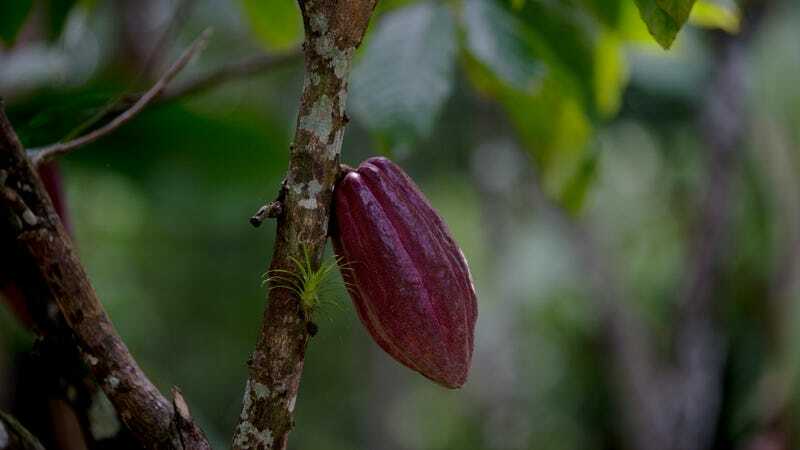 Mars, global supplier of M&M’s, Snickers, et al, is teaming up with scientists at UC Berkeley using the gene-editing technology CRISPR to create a disease-resistant cacao plant which can grow at different elevations. It’s another test of whether gene-editing technology CRISPR, which has already been used to turn mice’s feet green and make super-dogs, will save us. One of the inventors of CRISPR, Jennifer Doudna, who’s overseeing the project, has expressed concern about the implications of her technology and eugenics, but she seems optimistic about longer-lasting tomatoes. Mixed feelings, but SAVE THE CHOCOLATE. In August, the Daily Californian reported that underpaid research associates are working nights and weekends at the lab partly to preserve our under-appreciated candy bars.